The UVic Alumni ONECard gets you access to discounts and special privileges at a variety of on- and off-campus businesses for a ﻿one-time fee of $20. It's also part of a new campus-wide ONECard system. The new photo ID offers alumni access to a number of new and planned campus services and card rewards. Alumni Card partners and services. Learn more about University of Victoria ONECard services. Alumni cards will be issued from the ONECard office in the lobby of the University Centre at a cost of $20. Please provide the ONECard office with your UVic student number and a piece of government issued identification. You will be required to have a new photo taken at the ONECard office and cannot use your existing student or alumni photo. If you don't know your UVic student number, contact the registrars' office at 250-721-8121 (general inquiries). Or contact the registrars' office by email at studentsupport@uvic.ca. Please have your student number BEFORE you go to the UVic ONECard office. Your student number will start with a V.
If you don't have a UVic Netlink ID (required for library services) you can get one by using the Self Serve Application for NetLink-ID. New graduates can purchase an alumni card ($20), either in person or by mail, once the ONECard office has been updated to show your new alumni status. This will happen one week prior to your convocation (in the months of June and November depending on your convocation ceremony). Cards can be obtained in person from the UVic ONECard office in the lobby of the University Centre, Monday to Friday, 8:30 a.m. to 4:30 p.m. and Saturday, 10 a.m. to 2 p.m.
Bring your student number and one piece of government issued photo ID with you. If you live outside of Victoria, email onecard@uvic.ca for more information on how to obtain your UVic Alumni Card. For more information about the ONECard office call 250-472-4554, visit online or e-mail them. 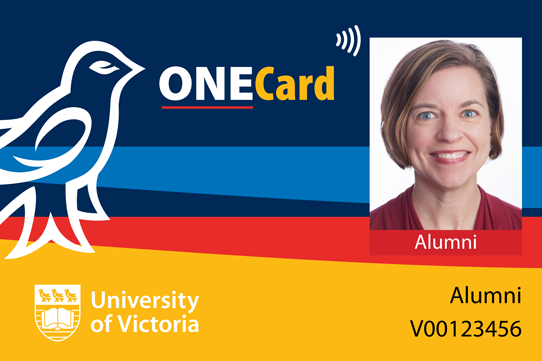 The ONECard replacement card cost for UVic alumni or affiliate is $20. Do I need to update my current Alumni Card to the ONECard? Offering the services of multiple cards in one, the ONECard will be your official UVic alumni identification card on campus. In the future, your ONECard will have the capacity to integrate access to other campus services, including vending and building access. ONECard is more streamlined, flexible and secure than the current UVic ID card. In order to continue to enjoy campus services like the UVic Library, it is important for all alumni and affiliates to obtain a UVic ONECard. Please visit the ONECard site for details. Where do I direct my questions and comments? Questions and comments about the UVic Alumni Card can be directed to Alumni Relations at 250-721-6000 or by e-mail. Once I have my card, how do I stay updated? Be the first to hear UVic Alumni Card news by visiting our website, reading our e-news Alumni Monthly and by connecting with us on social media. We post updates on promotions, new partners, contests and events.